Riders meet at 49th Parallel, 2198 4th Avenue in Kits – 8:30am hard start. North Shore riders meet in the parking lot across from 2nd Beach at 8:50. 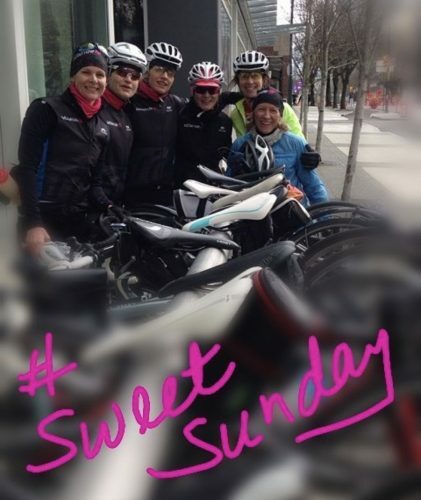 Let’s dust off our bikes and roll out for our first Sweet Sunday ride of the season. Due to potential interference with the Pacific Populaire course we are doing Stanley Park Loops. See the route here. Stanley Park is that perfect mix of fast flats, false flats and hills. And will give you that benchmark of what feels good and what needs work. Our trained Domestiques will get us safely over the beautifully renovated Burrard Bridge and through the construction on Pacific & Hornby to the park. Riders will be divided based on ability, experience and distance preferred. But plan on riding about 40km or so. Please click on this link and review “How to ride in a Group Paceline“..